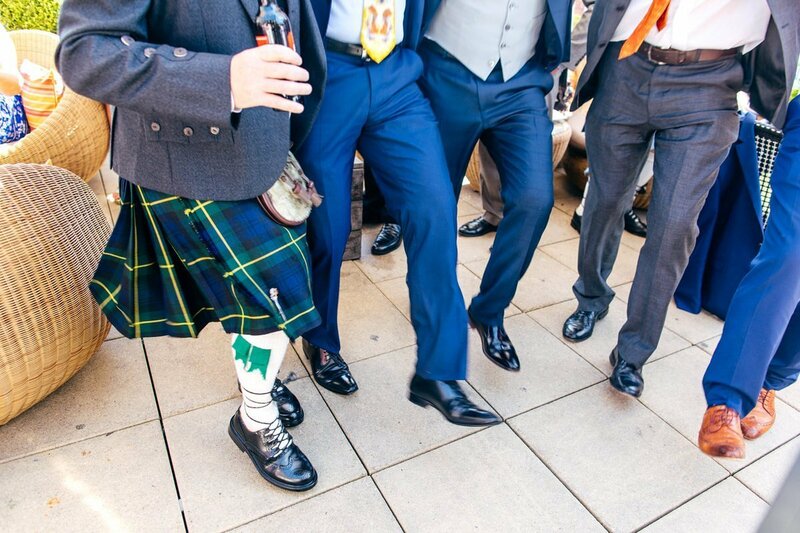 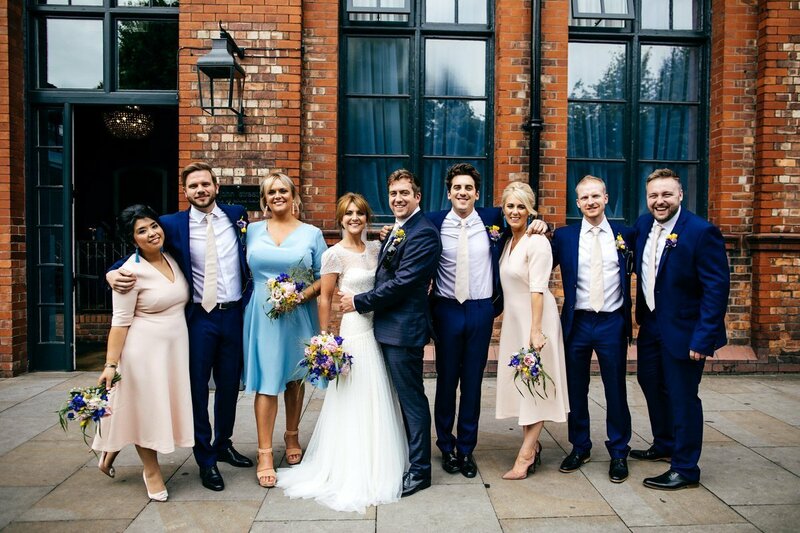 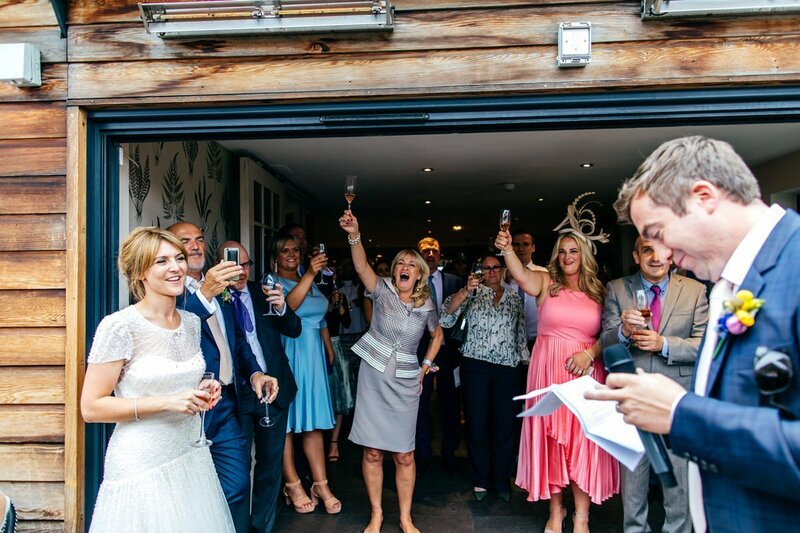 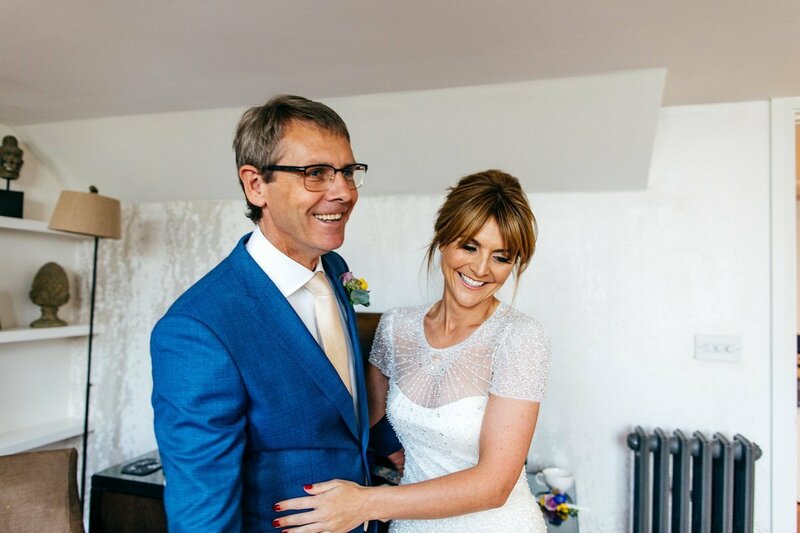 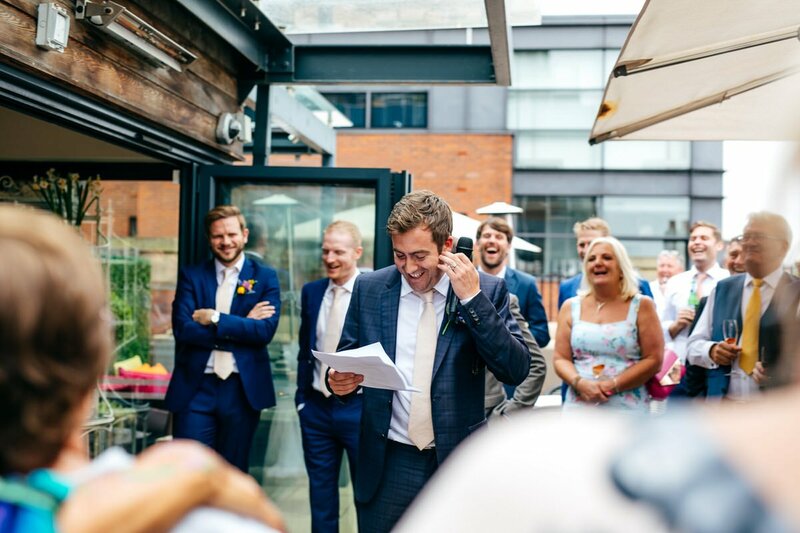 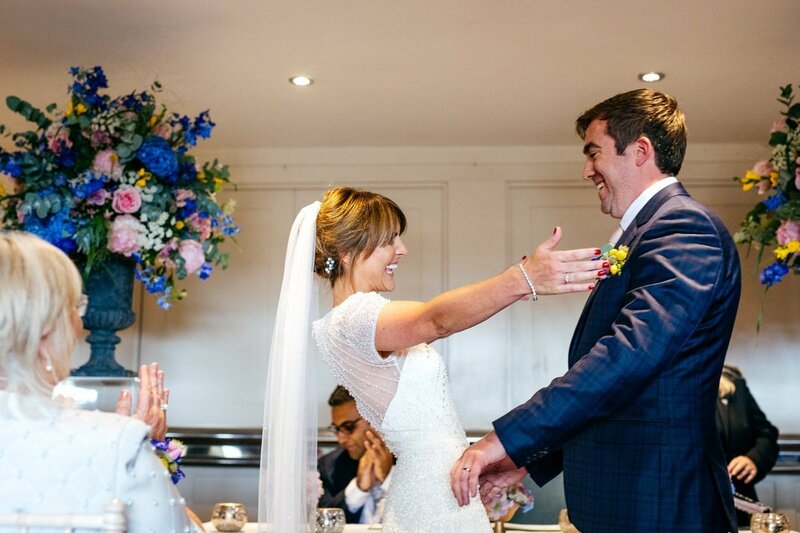 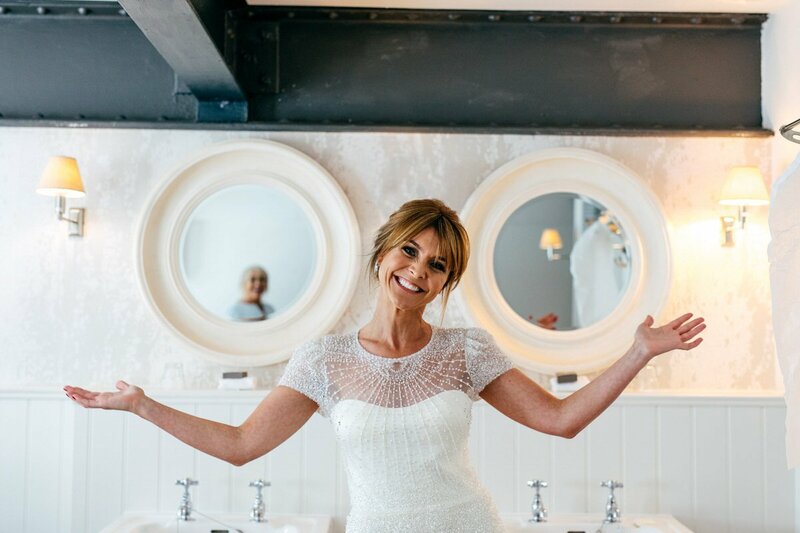 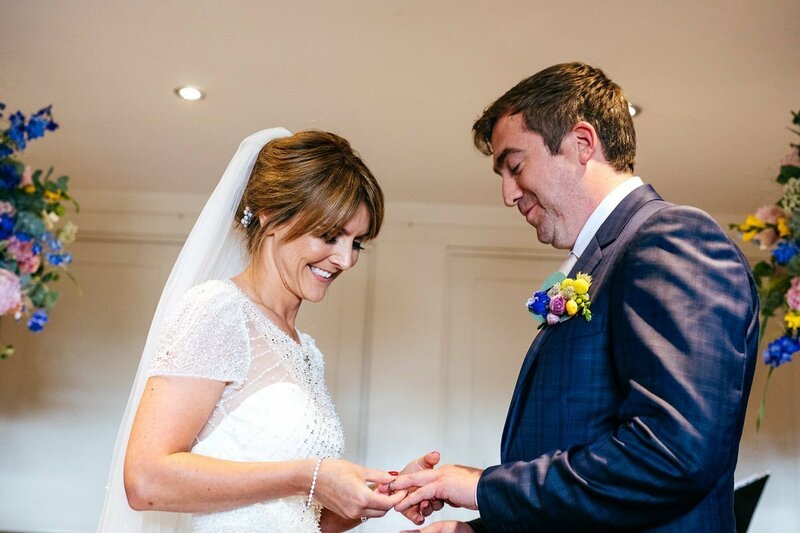 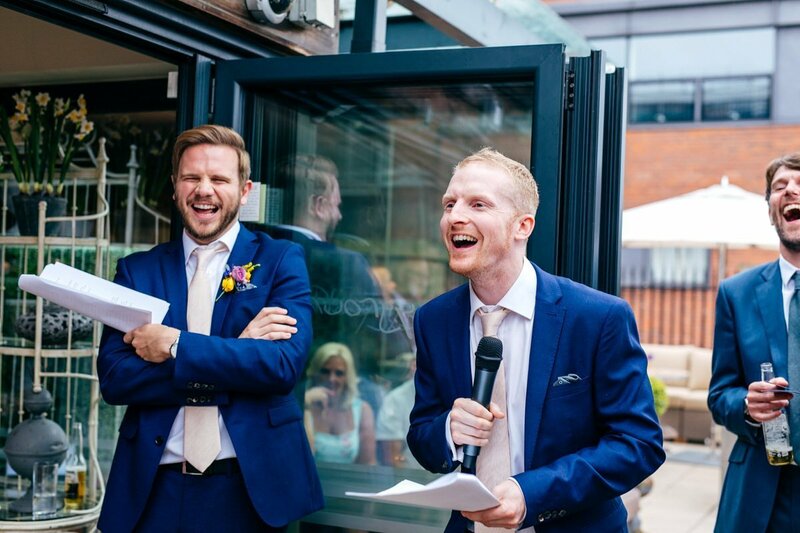 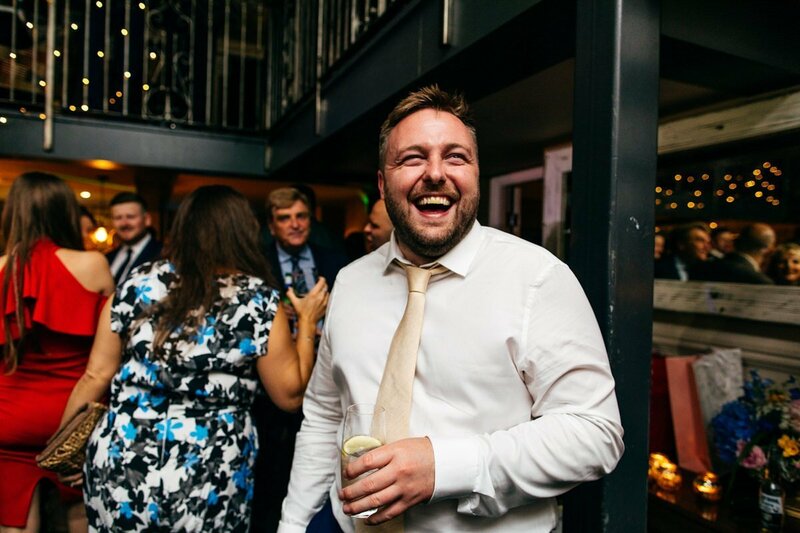 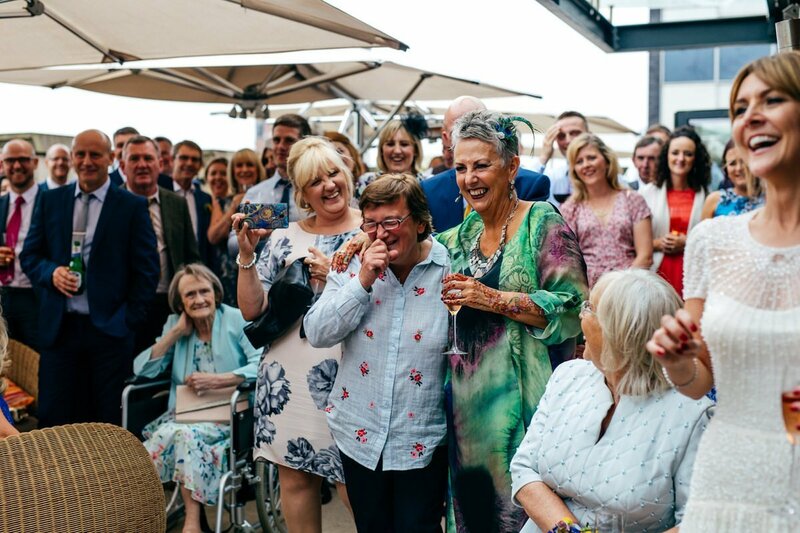 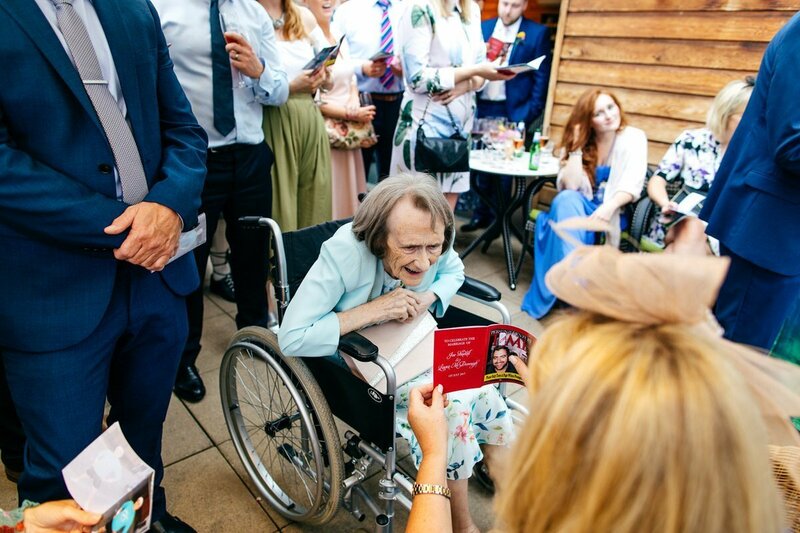 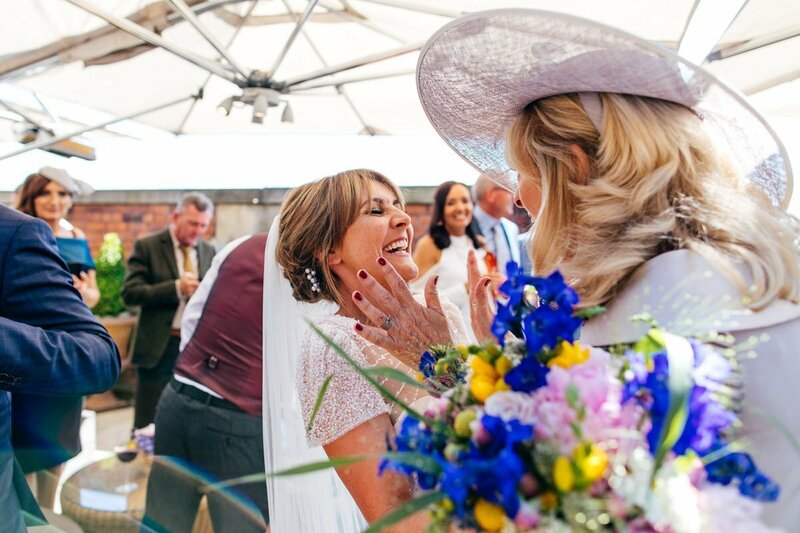 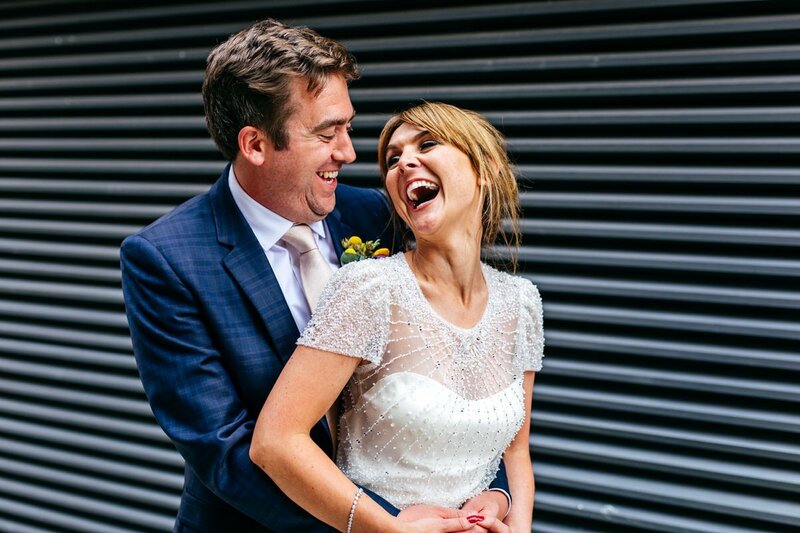 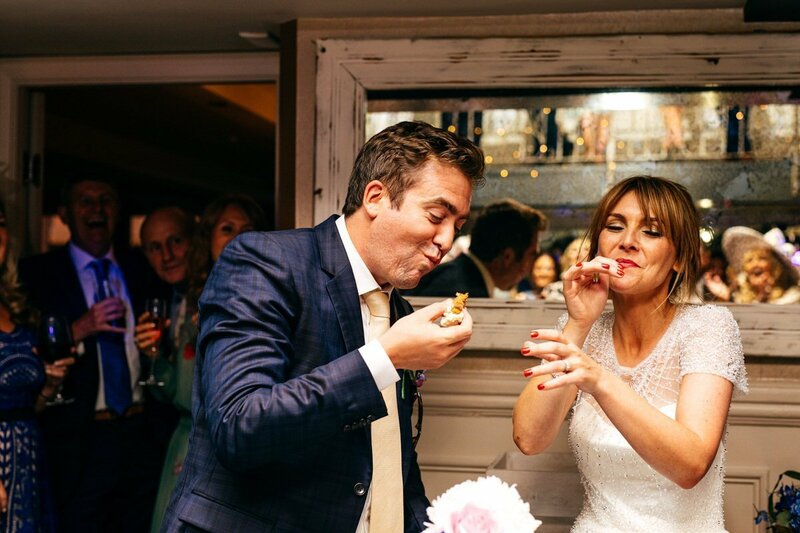 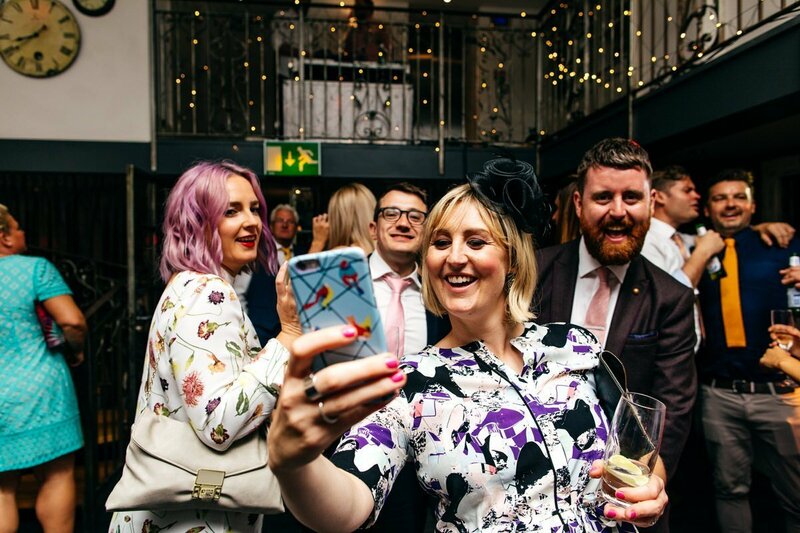 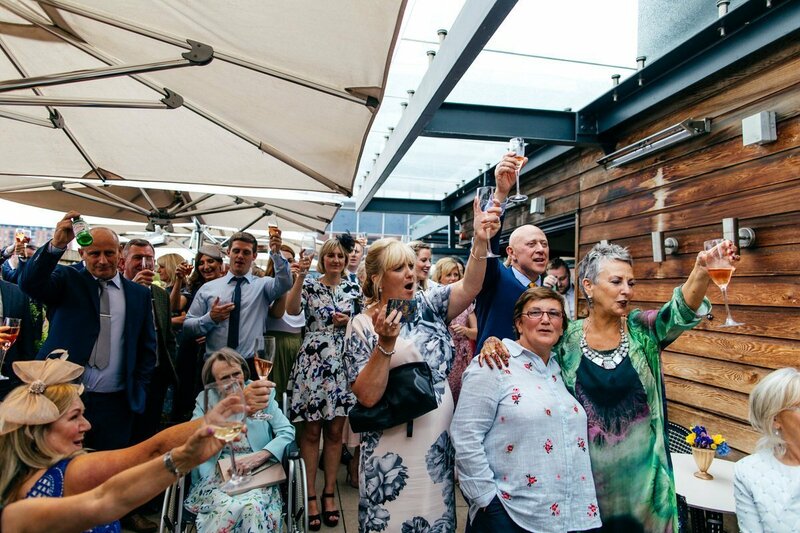 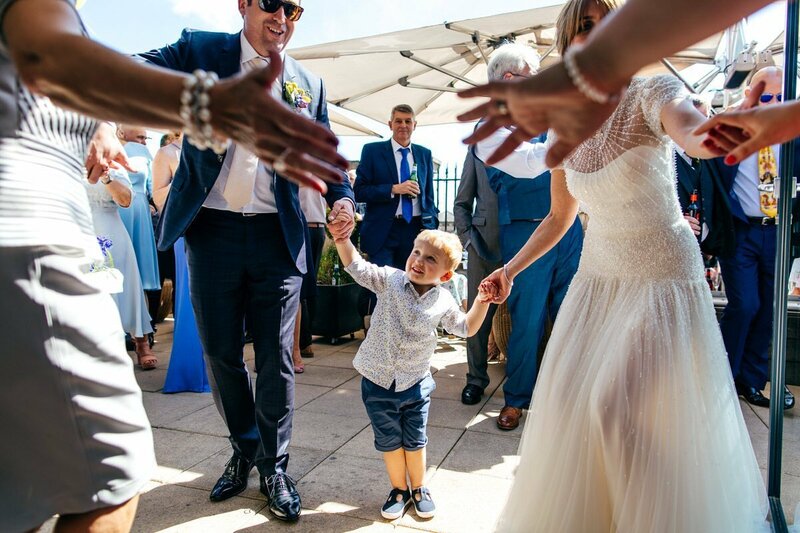 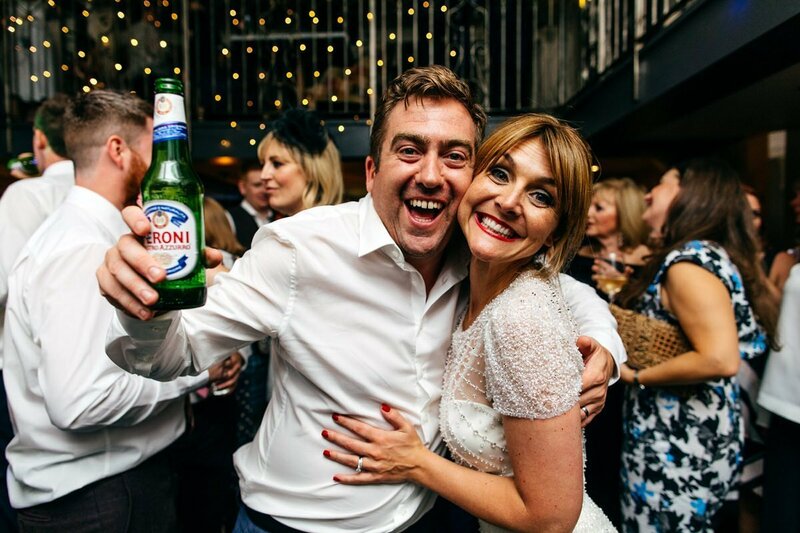 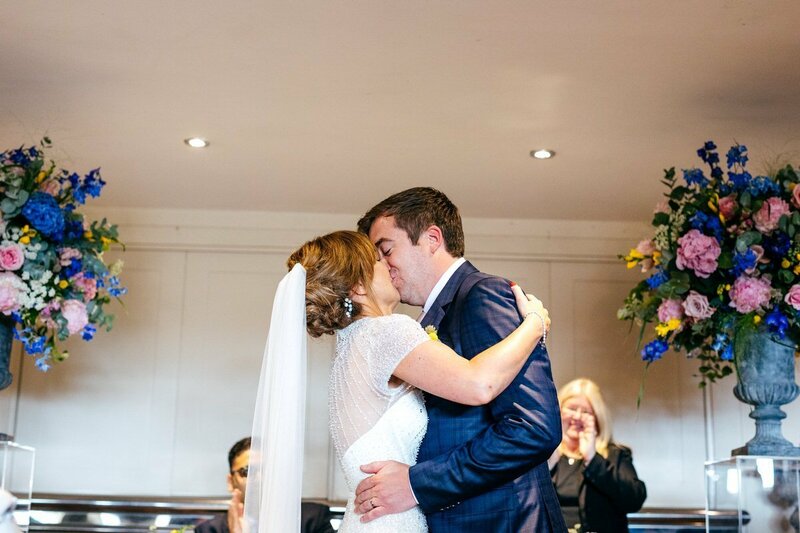 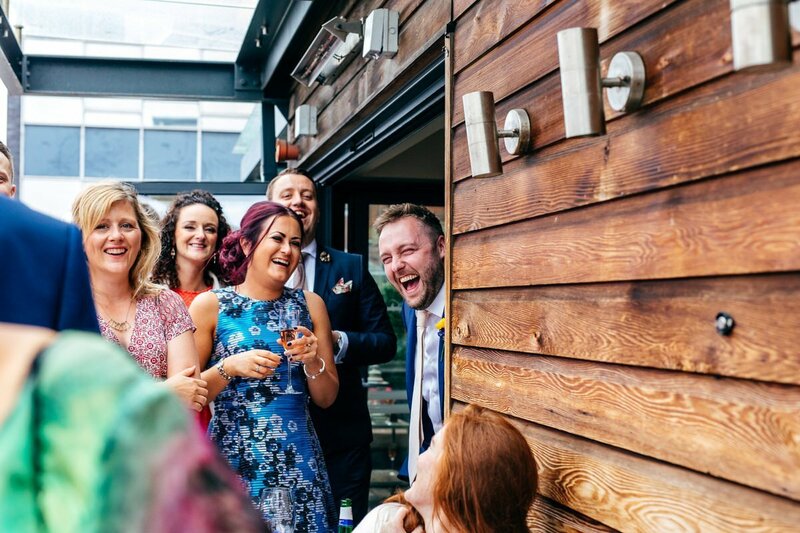 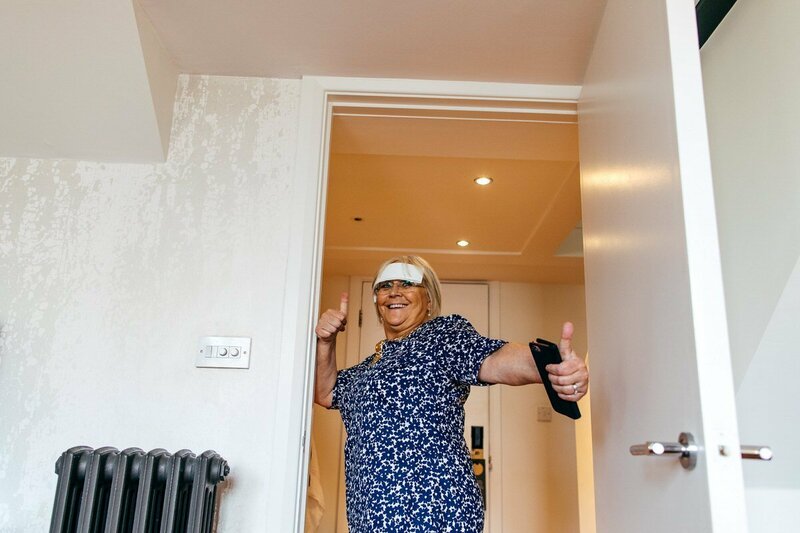 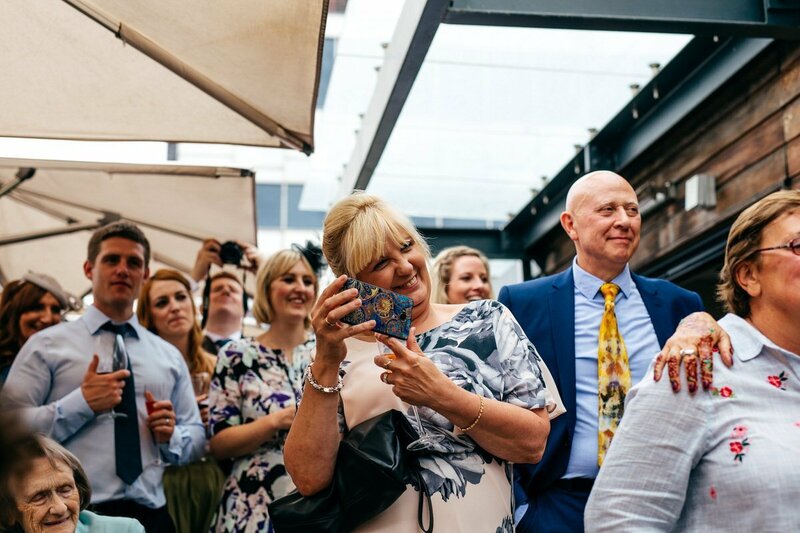 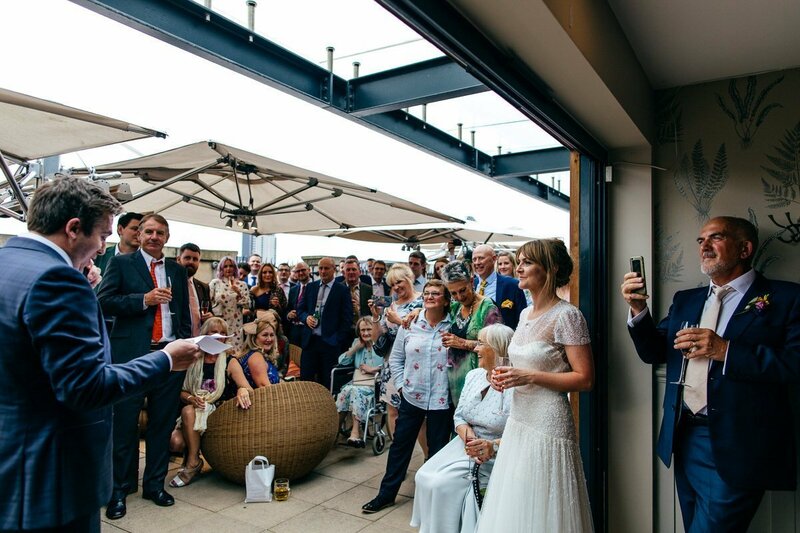 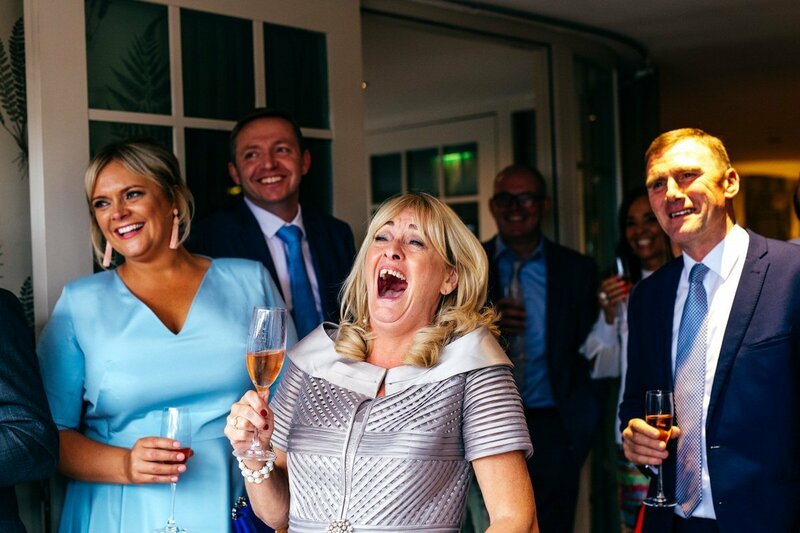 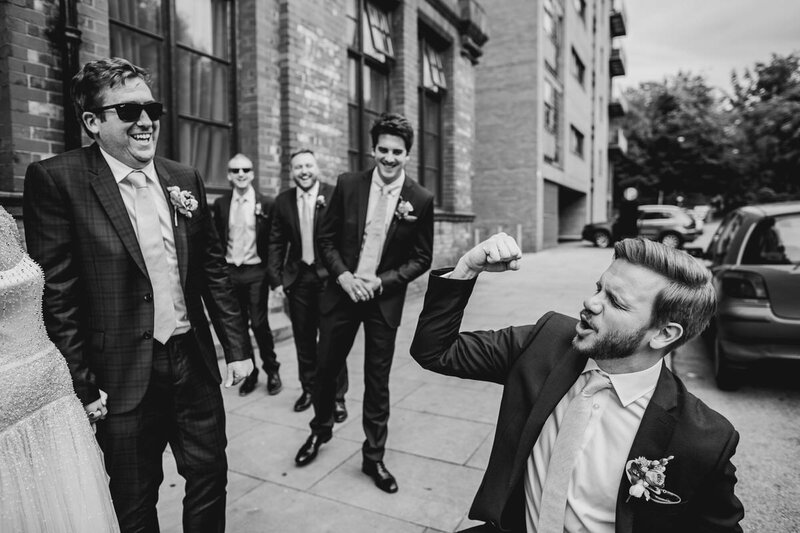 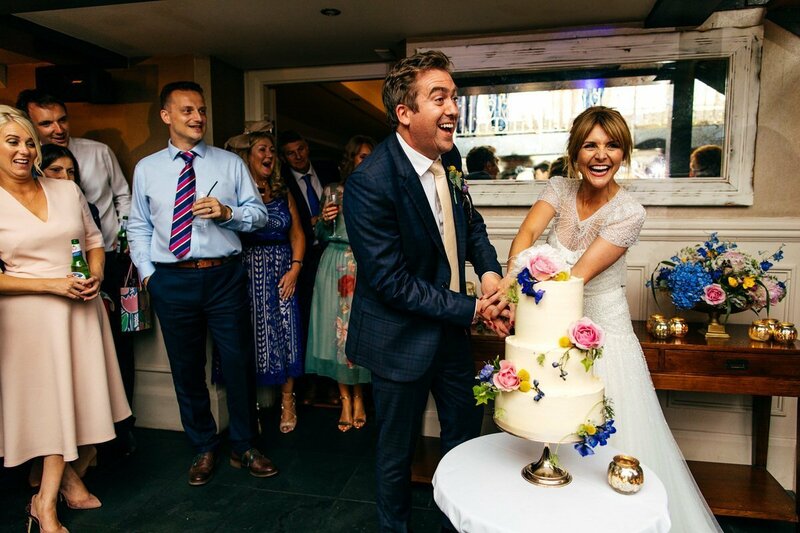 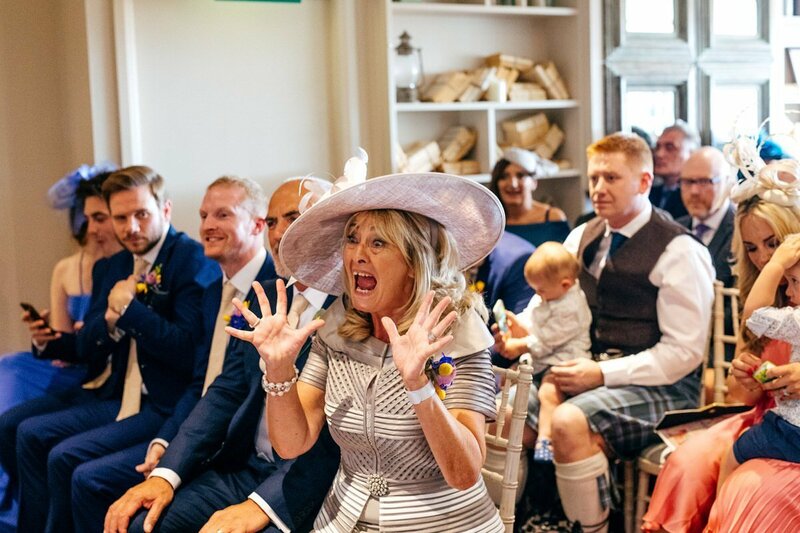 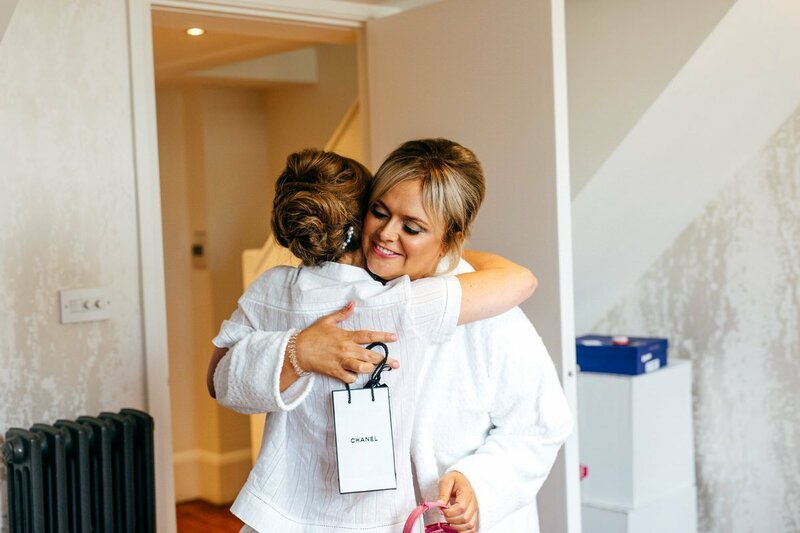 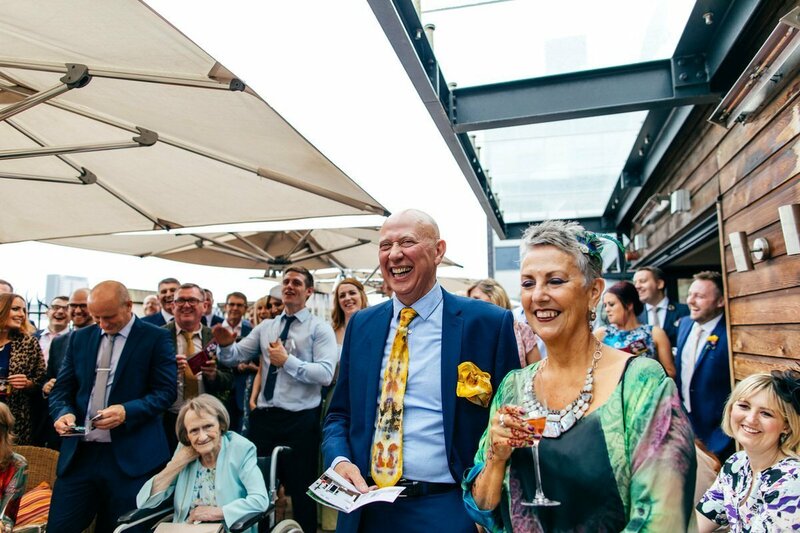 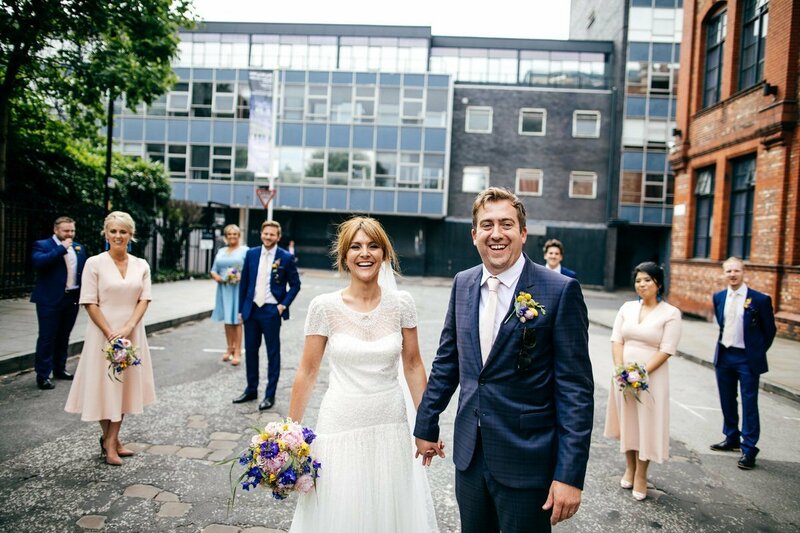 Great John Street Hotel Wedding // Laura & Joe's Manchester Great John Street Hotel Wedding was held back in 2017 and was a total hoot from start to finish. 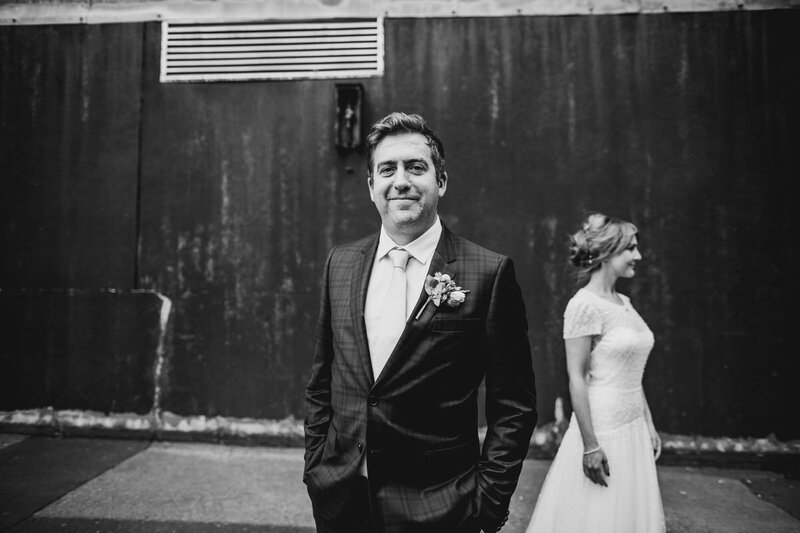 I have been meaning to share this one with you for toooooo long. 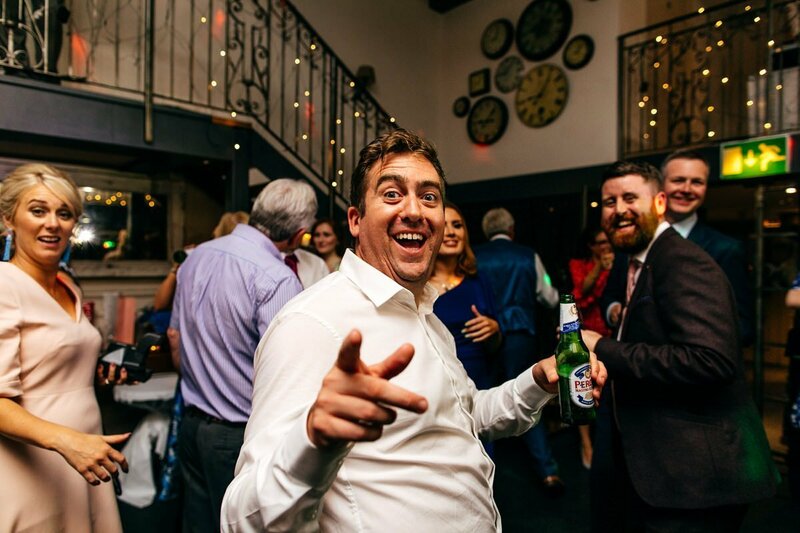 Soz! 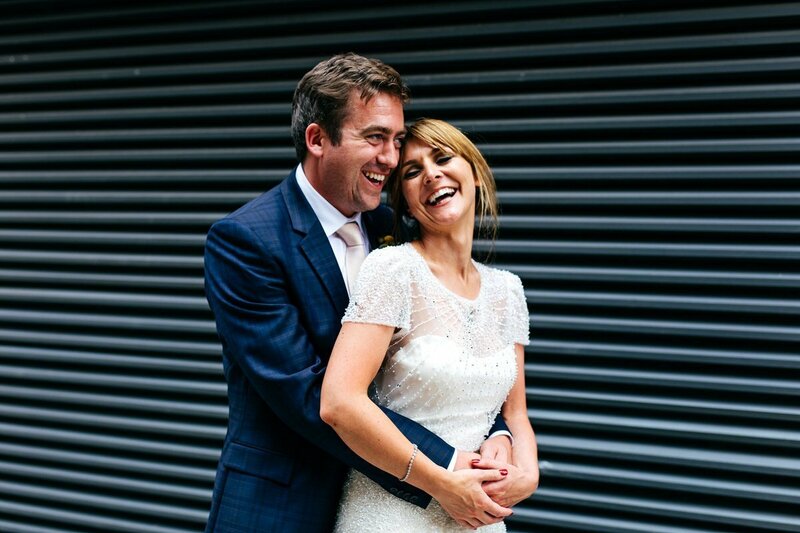 When I first spoke to Laura & Joe I knew their wedding day was going to be a relaxed, informal affair. 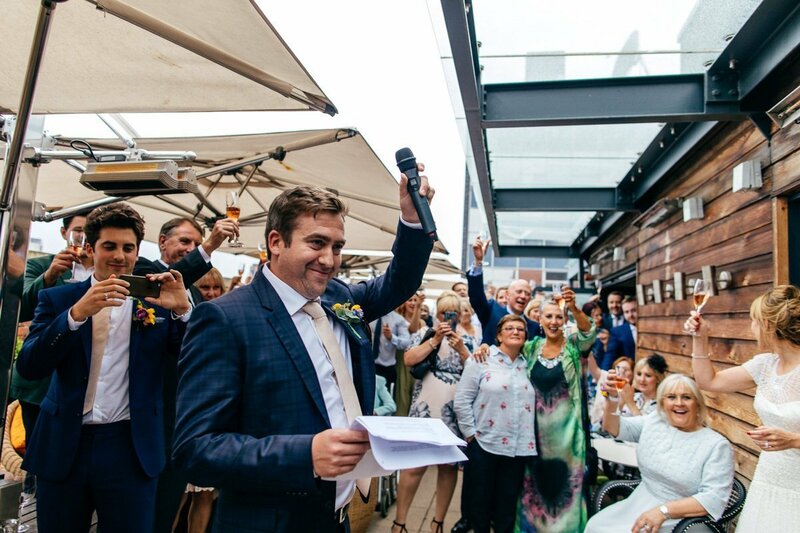 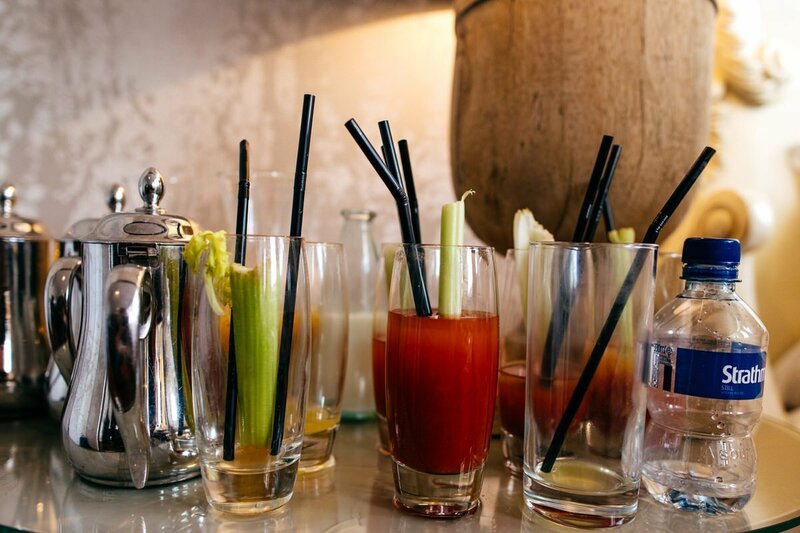 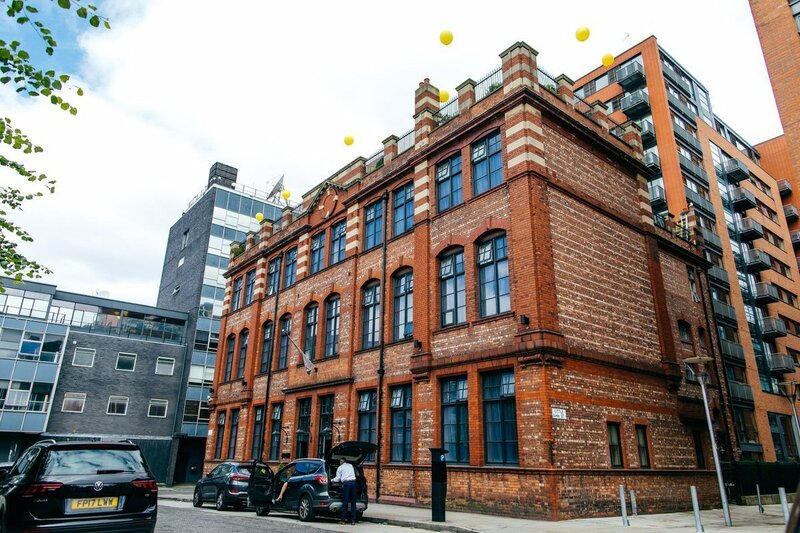 The whole day was to be at the Great John Street Hotel which instantly makes a city wedding more chilled - no getting stuck in Saturday traffic or spending a single minute of the day further than 15 metres from a bar. 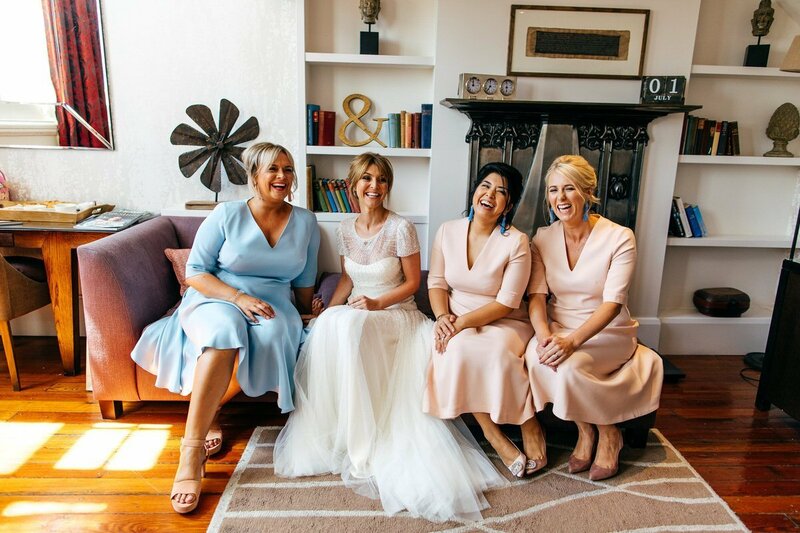 Laura looked absolutely knock out in her gorgeous Jenny Packham dress (which she bought from White Closet Studios) and I thought the bridesmaids LK Bennett dresses were dreamy too. 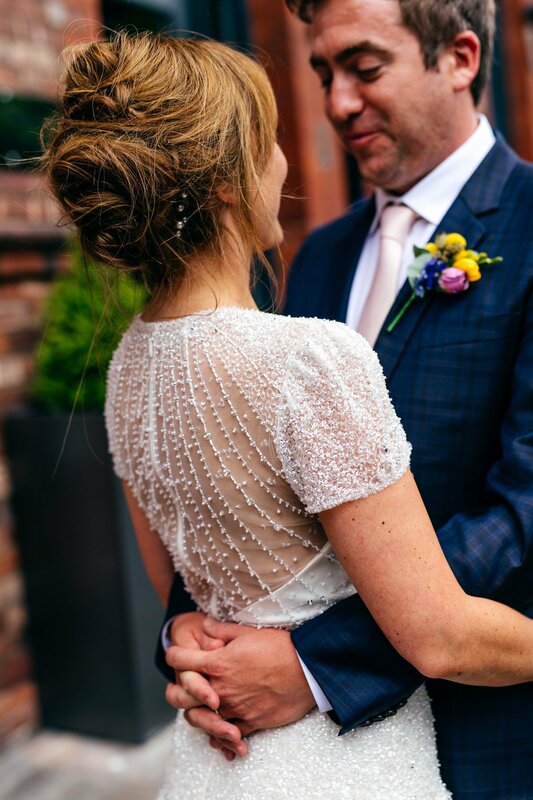 Laura went all out on her bespoke veil too having Emma Beaumont sew stones from her dress on to it. 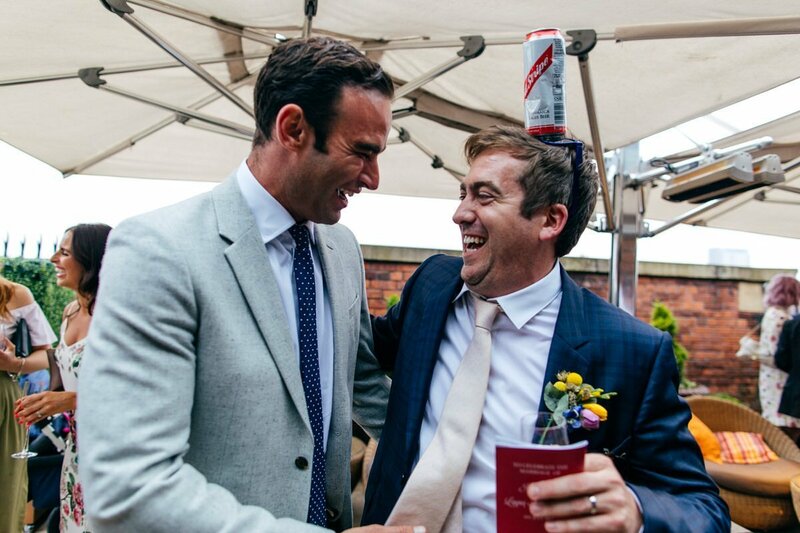 Joe - you also looked lovely in Paul Smith - especially when you had a can of Red Stripe affixed to an alice band on your head. 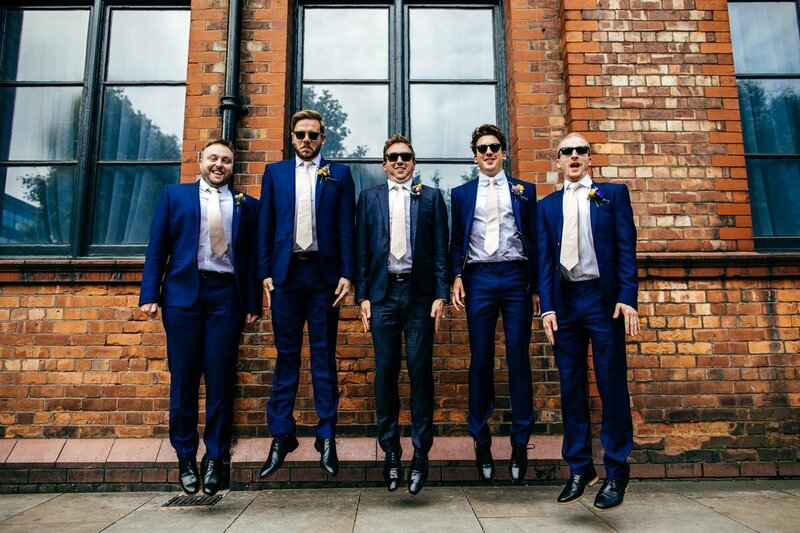 I thought that really set the whole look off. 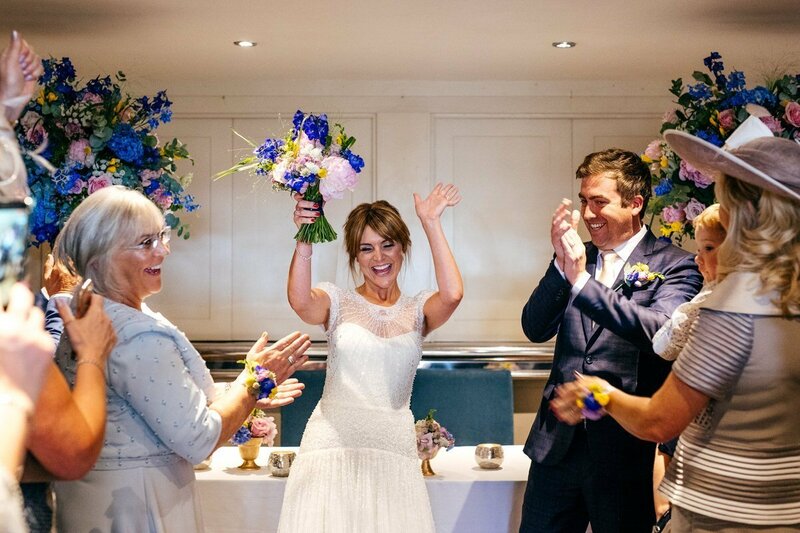 :-D Big, blousy, brightly coloured flowers were provided by Verdure and looked ace. 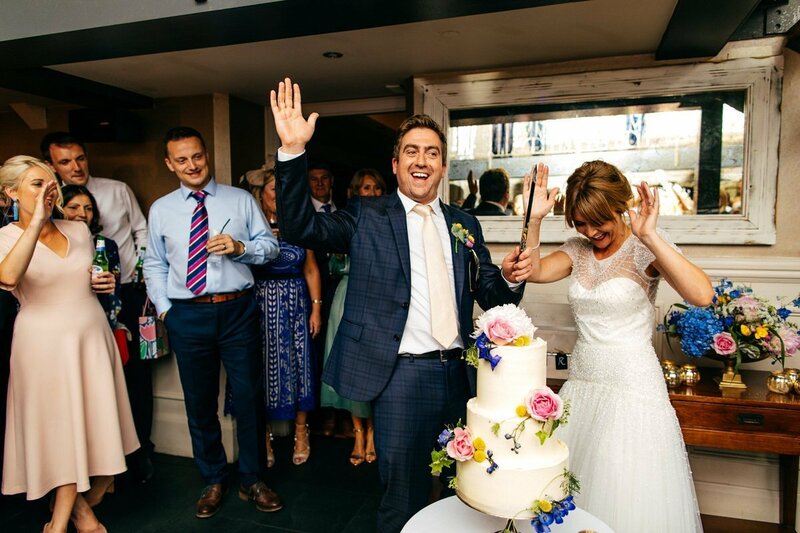 Special mention must also go to Laura at Yolk who made the couple a super wedding cake that not only looked good but also tasted divine. 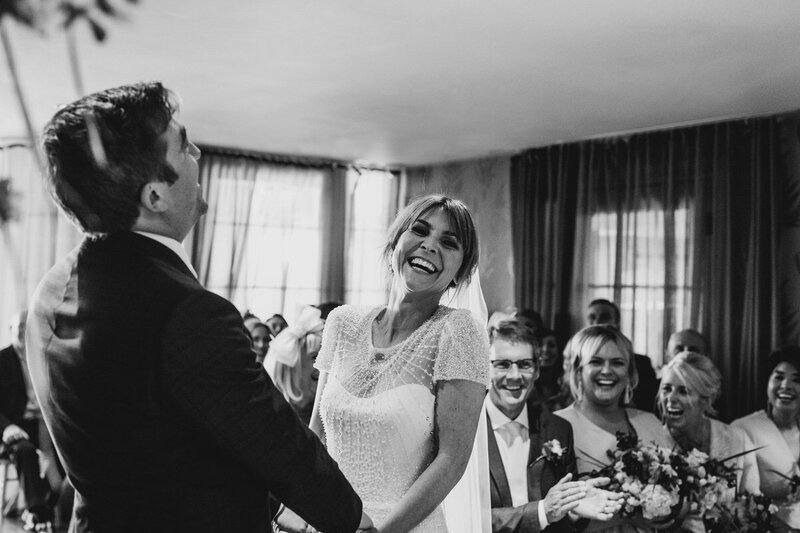 Laura & Joe got married in a laugh filled ceremony - I was most amused by the registrar who looked unsure what was quite so funny. 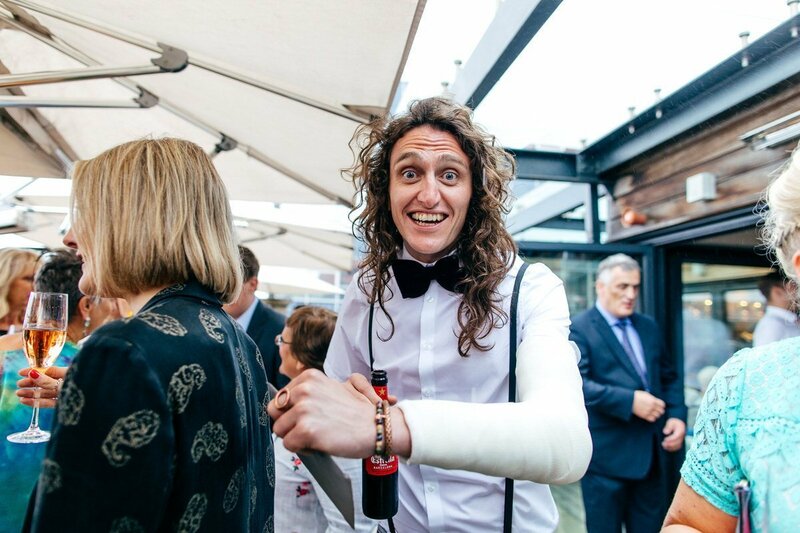 I hope he didn't take it personally though because everyone and I mean everyone spent the whole day laughing. 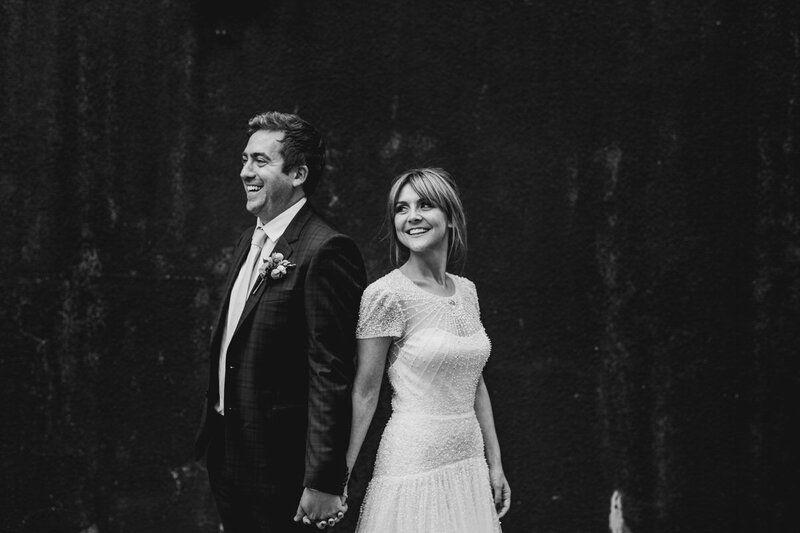 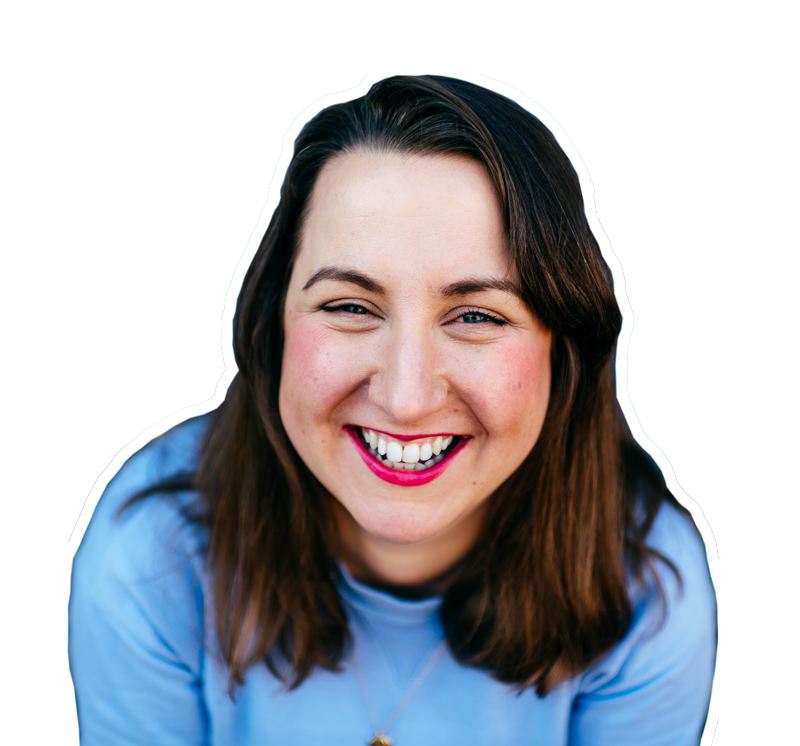 Later on, Laura & Joe took a short stroll around the block with me for some portraits - I love me a crumbly concrete wall and the mix of Victorian brick and modern city scenes really floated ones boat. 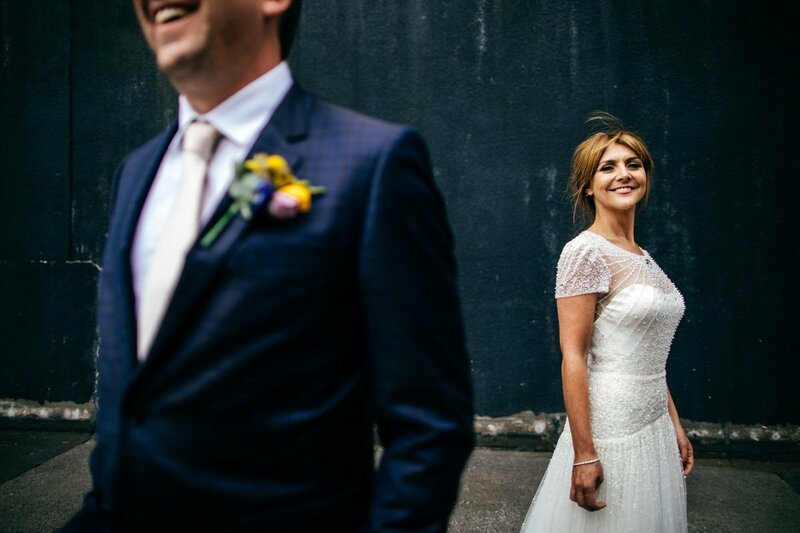 Laura & Joe fully trusted what me to do my thing and despite not meeting them in person before the wedding day they were totally themselves in front of camera…which is my fave. 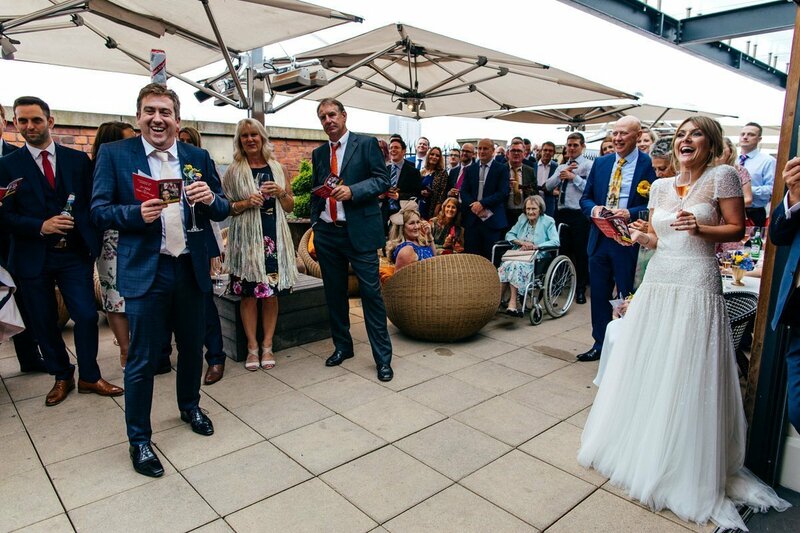 Thank you to Laura & Joe for having me along to your wedding. 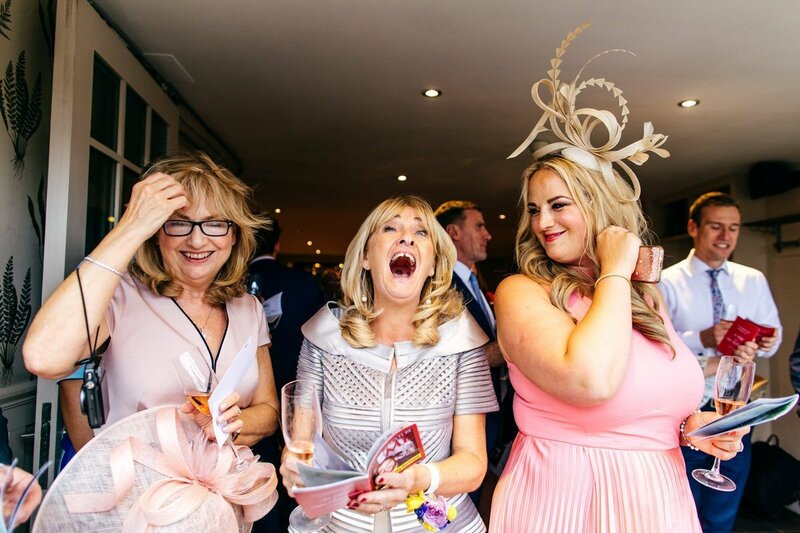 I had such an amazing time and have never met two mums as fun and (good) mental* as your two. 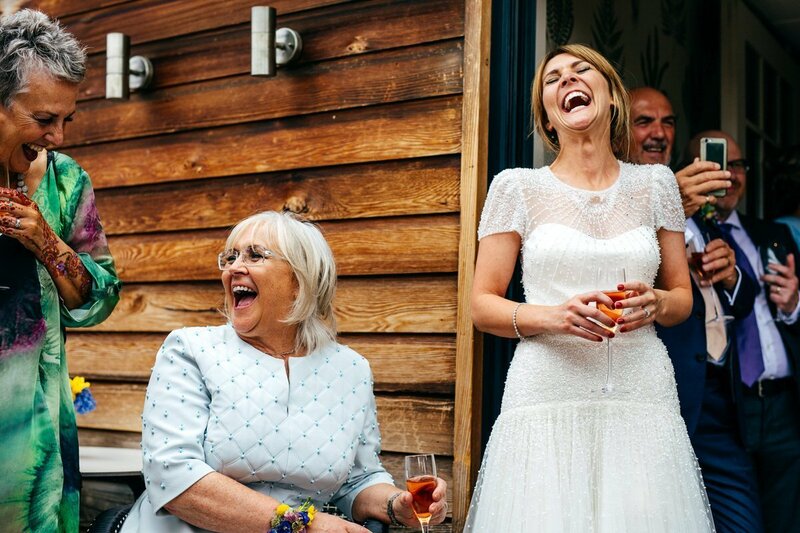 ( *I am qualified to say this as my own mum is quite a lovely nut job herself!) 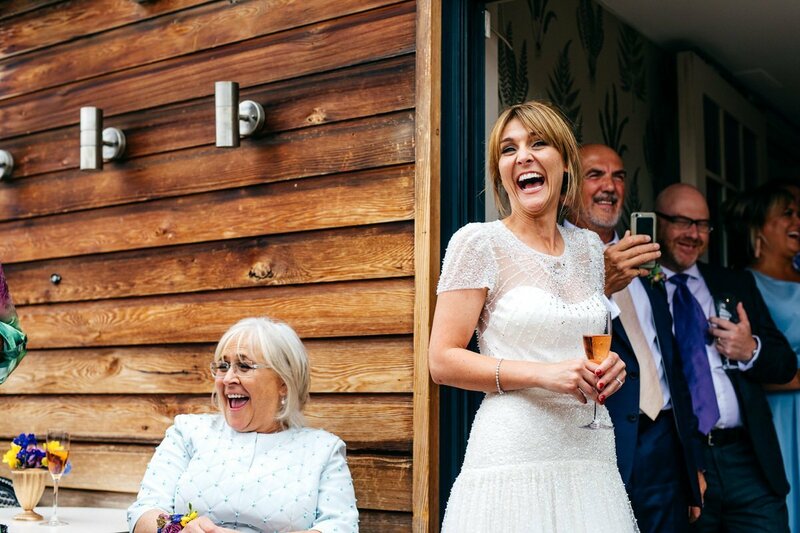 Wishing you all every happiness. 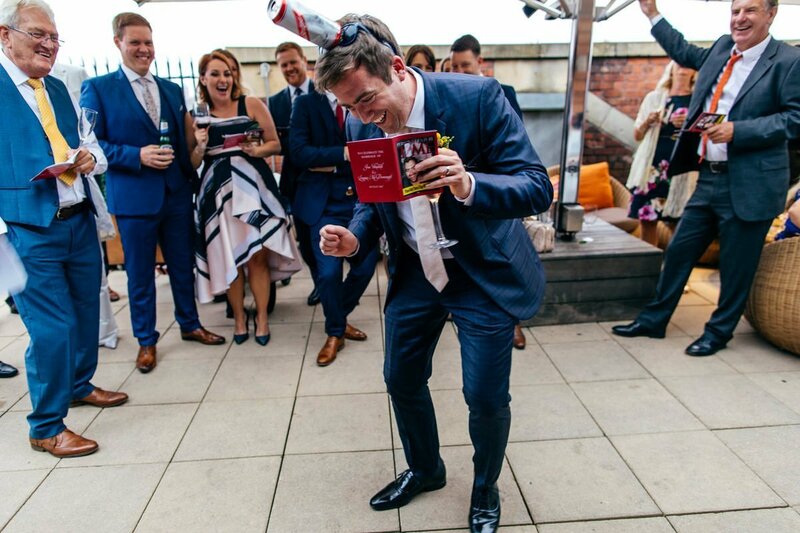 I just know you are going to have a ball. 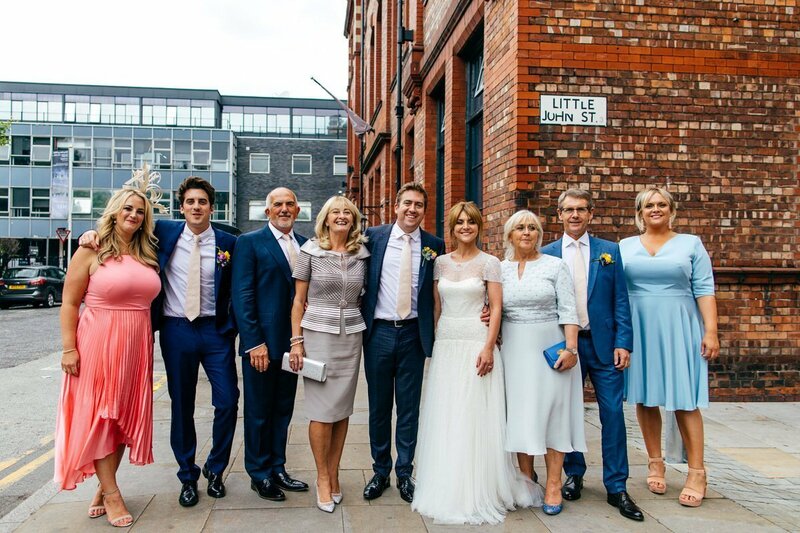 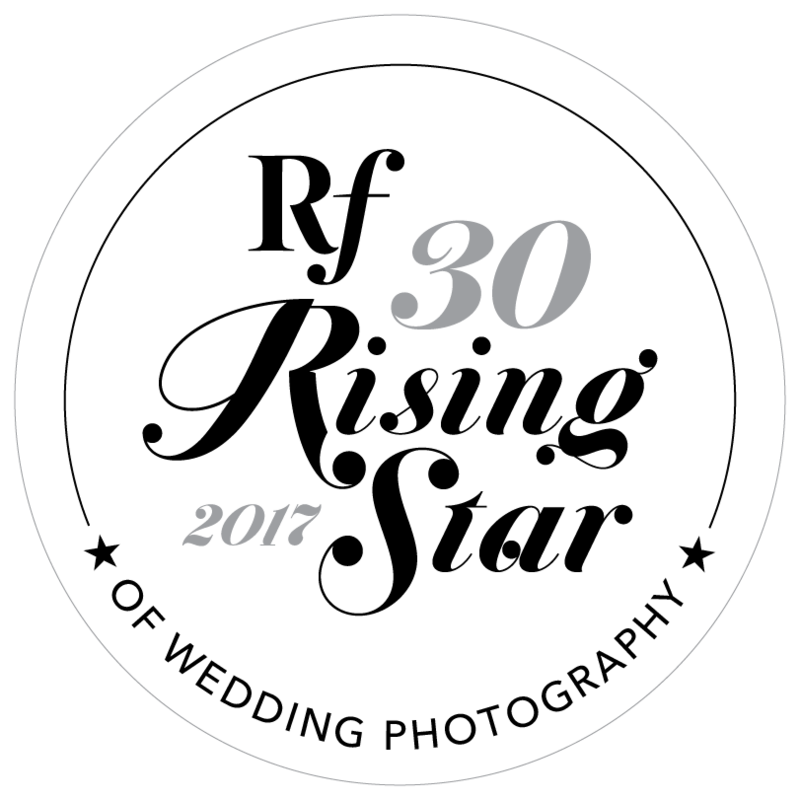 Here are a selection of my favourites…. 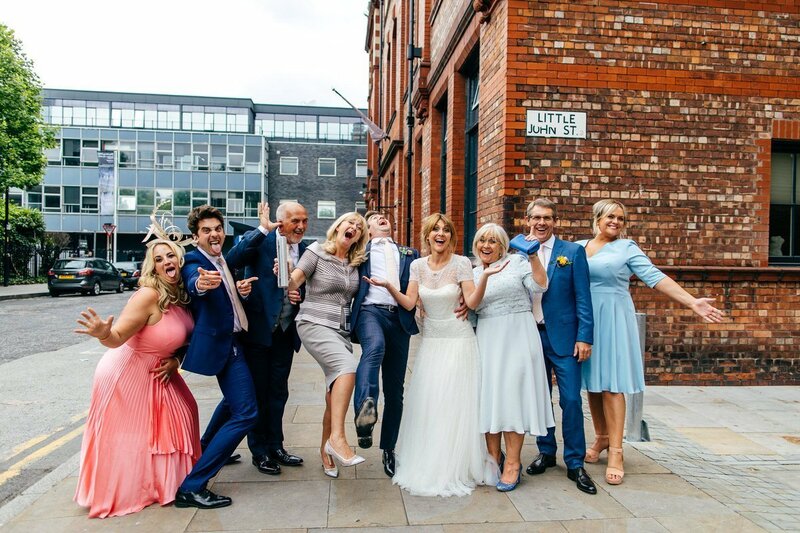 If you are getting married in Manchester at The Great John Street Hotel then I would love to be your wedding photographer! 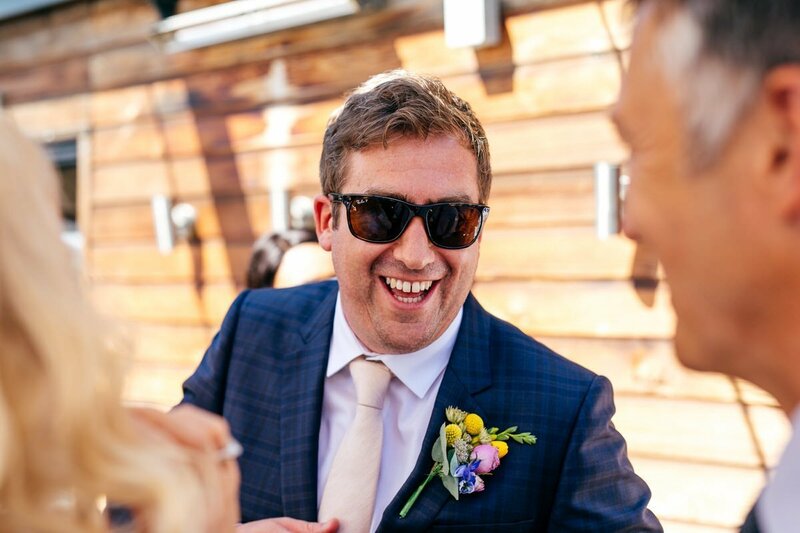 Drop me a line if you like the look of me and my work. 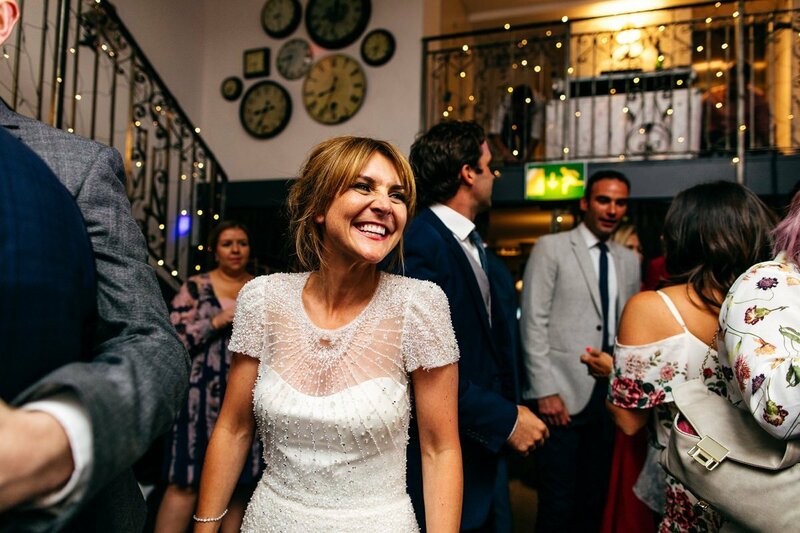 Random ramblings: Myself and my husband had a very small wedding in the oldest working cinema in England - which happens to be in Birmingham. 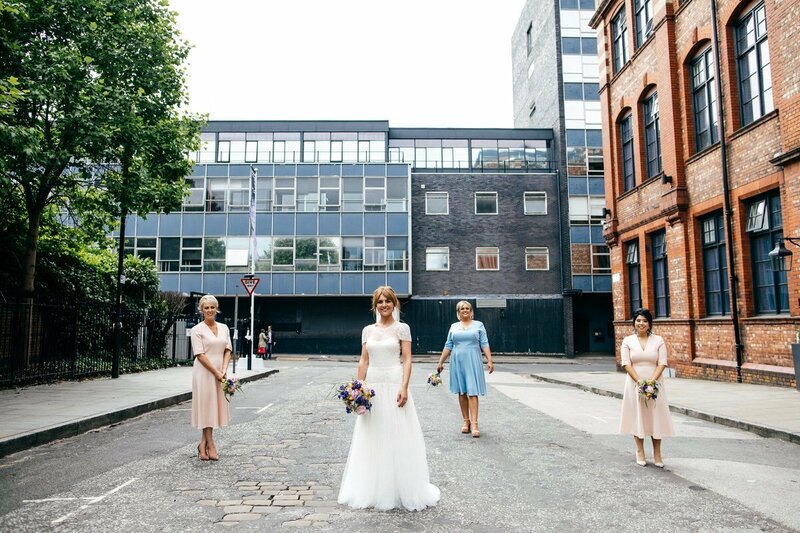 It was a fab day free of stuffiness or pressure. 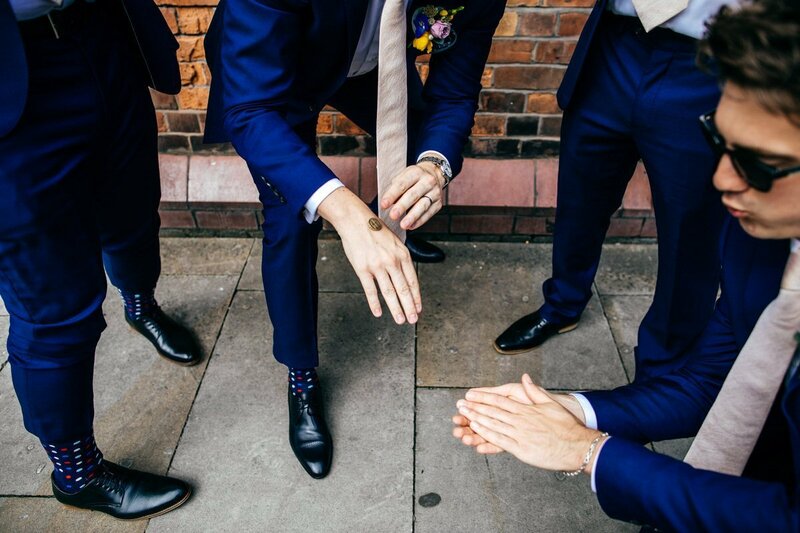 It suited us down to the ground. 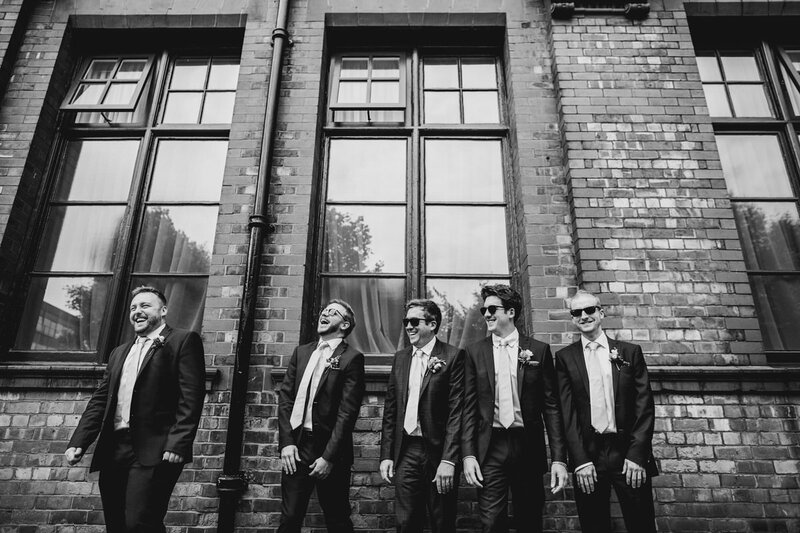 I photographed my first ever wedding in 2007 and have now shot almost 200 weddings. 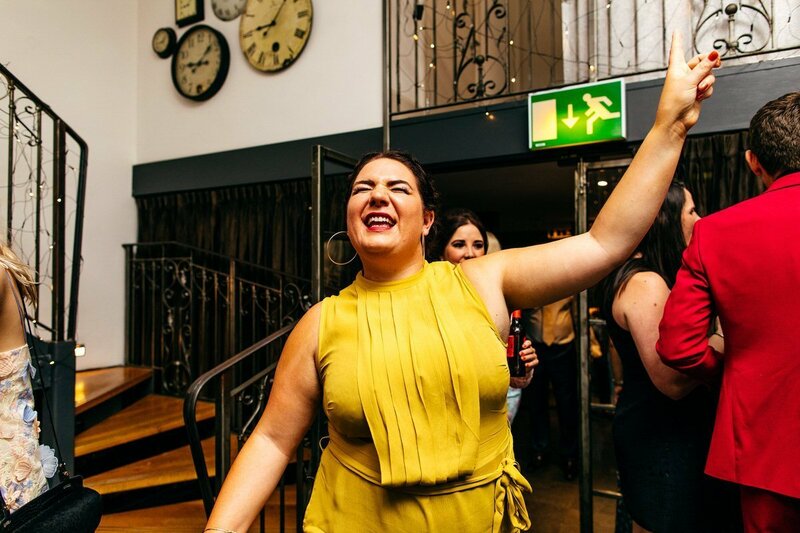 I love my job - I feel very lucky to go to so many parties and be surrounded by ace people having the best time.